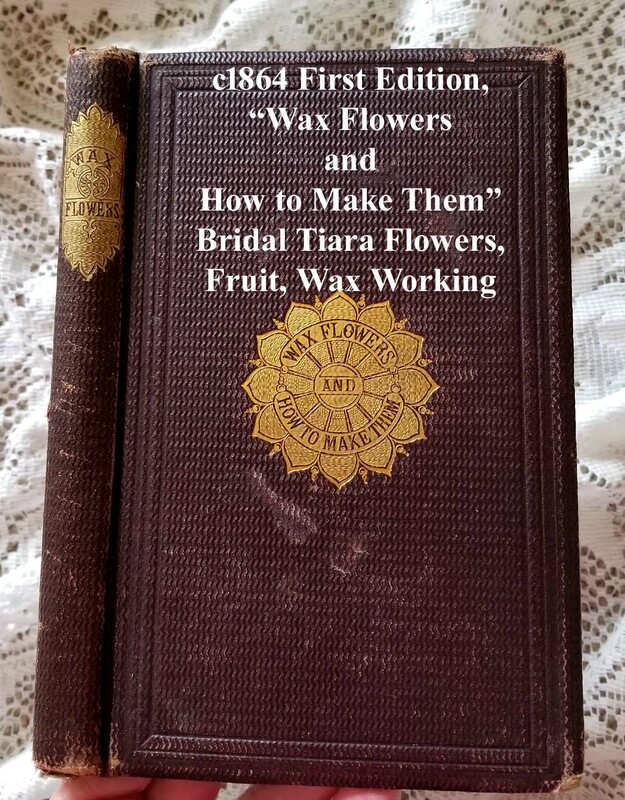 This First Edition book from 1864 dates right to the Civil War Period, and is entitled Wax Flowers and How to Make Them. 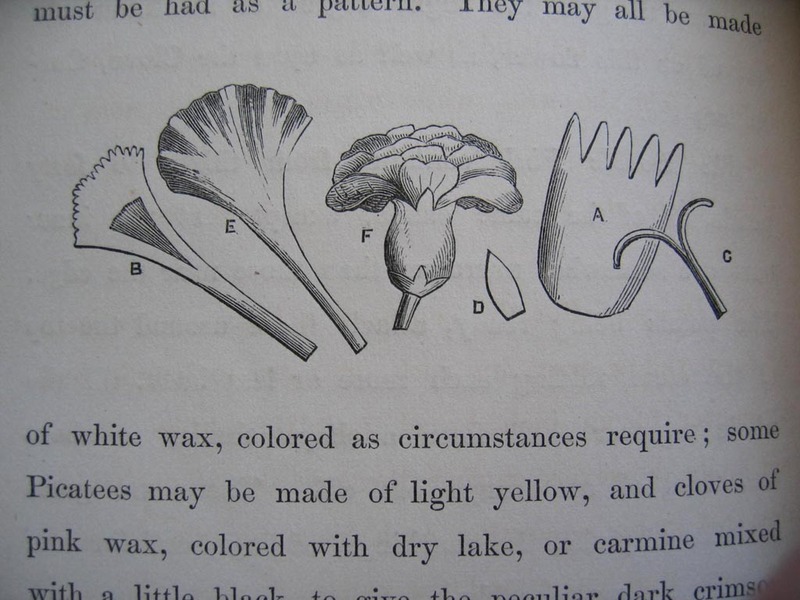 It is a generous textbook on how to make all wax flowers, fruit, buds, leaves, and more. 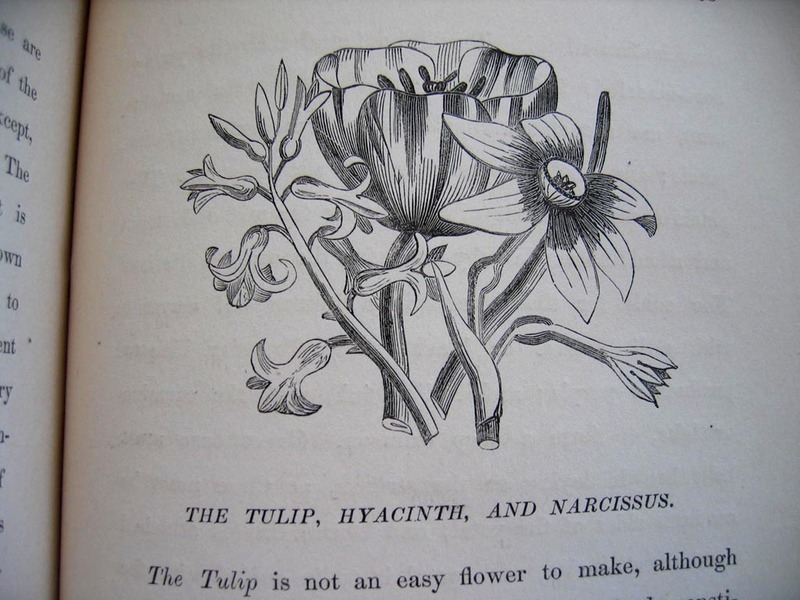 It is especially intriguing, as this was the type of book ladies used to make their bridal tiara wax flowers! Wax Fruit: Making moulds of two parts; mould for an orange; moulds for lemons, citrus limes melons; moulds for peaches, apricot, filberts, walnuts, almonds; mould for half fruit; moulds of many parts; moulds of the pomegranate; mould of a cucumber and egg; mould of a mulberry, raspberry; pine apple; section of fruit; moulds of small fruit; grapes, currants. Casting the Fruit: Casting an orange; casting other fruit; stalks; solid fruit. Finishing the Fruit: To prepare the fruit previous to coloring; coloring sections of a fruit; putting on a rosy tint; putting on streaks, specks, and irregular patches; to put a downiness or powdering upon fruit; varnishing a fruit. Small Clustered Fruits: Not made by casting nor in wax; to make dark grapes; to make white grapes; to make currants; general observations on casting wax; elastic moulds; to obtain and prepare wax; to whiten wax; to clean a brush; to remove wax from a dress. Wax Flowers: Articles and materials required; making sheets of wax; white; yellow; pinks and reds; blues; greens; colors required; white and green down; brushes; patterns and shapes; stamens and pointal; to make waxen leaves; to make succulent stems, buds, etc. 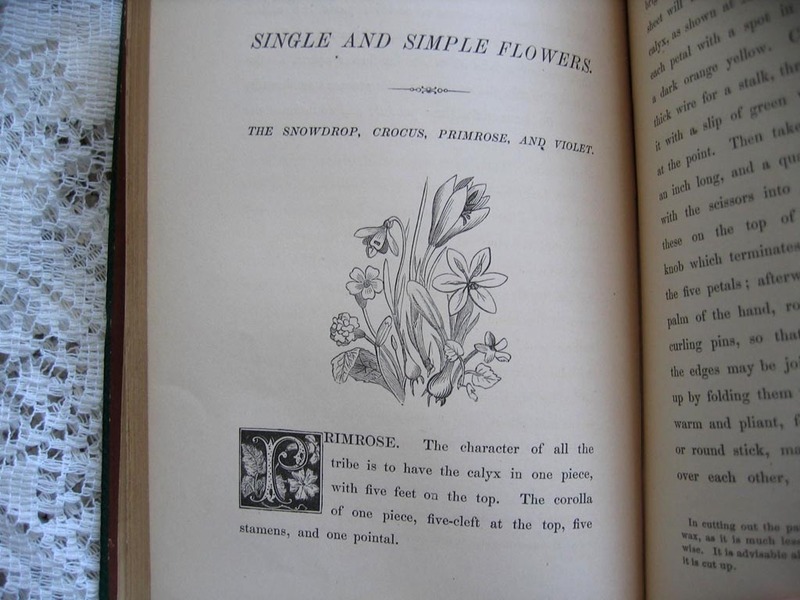 Modelling Simple Flowers Single and Simple Flowers: The snowdrop, crocus, primrose, and violet; the crocus tribe; crocus sativus, the snowdrop; the violet; the heartsease (pansy); the tulip, hyacinth, and narcissus; the Van Trol, or sweet-scented early spring tulip; the narcissus; the pink, Jessamine, daisy, forget-me-not, coreopsis, etc. 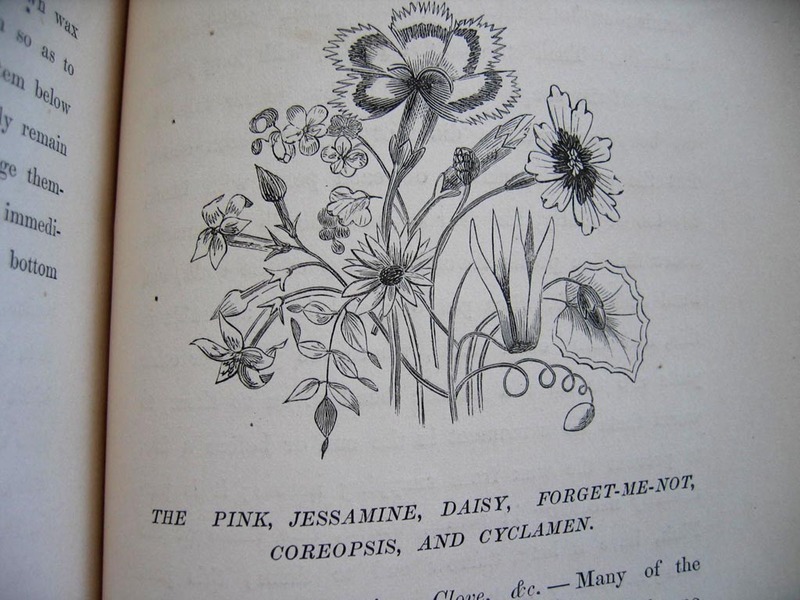 ; the single pink; the double pink; clove and carnation; the jasmine; the daisy; the forget-me-not; the coreopsis; the cyclamen; other simple flowers; the laburnum; the convolvulus (lily of the valley); the fuchsia, engraving of a large fuchsia; various parts of the fuchsia of the natural size; bell flowers; the tobacco; honeysuckle; the poppy; the passion flower; the single rose; the chrysanthemum, china aster; and other quilled flowers; the lily of the valley. This book is just amazing. To think that young ladies were skilled at making all sort of floral specimens entirely out of wax, and that these same flowers adorned the bridal veil. You often see them in old cabinet card or CDV photographs, but hardly anyone know how they were actually made. There are 116 pages with instructions and illustrations. At the back is an index of other books to acquire with similar hand skills. This hardbound brown cloth has a textured cover with a gilt flower medallion in the center with the title embossed within. The boards are bevel edged. The edges of the cover boards, spine, and inside hinge pages have wear. Inside, the chocolate flyleaf hinge papers are uncracked, and the text looks unread; so most likely, the wear is just from shelving. 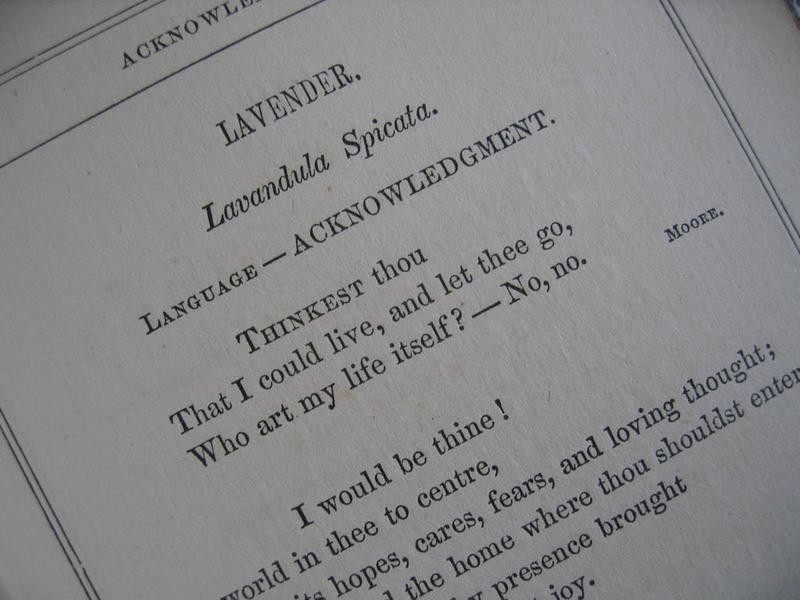 All in all, for its age, it is in remarkable condition, VG. Overall size is aprox 5 x 8 inches. This is an exceptional piece of history indeed.